Several years ago, I enjoyed going to a restaurant called European Connection. European Connection was like a Subway restaurant for crepes. They had savory crepes for lunch and dinner as well as breakfast and dessert crepes. You could build your own crepes with choices of different meats, veggies, fruits, sauces, and toppings. I had no idea how versatile crepes were until I ate at this restaurant. Sadly European Connection went out of business. Luckily, making crepes at home isn’t hard. 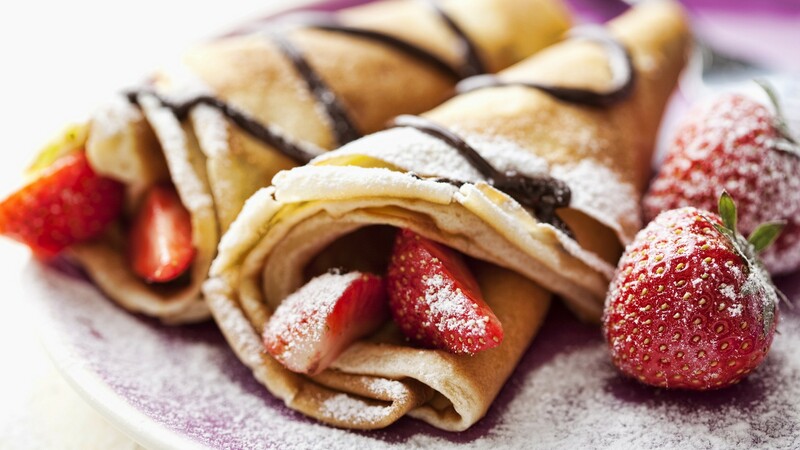 Crepes are a great option for breakfast, lunch, dinner or dessert. Here are a couple of tips for making the perfect crepes at home. Make sure the batter is the correct consistency . Crepe batter is thinner than pancake or waffle batter. It helps to make crepe batter in a blender so there are no lumps. Some people even like to strain the batter through a fine mesh sieve to be sure all the lumps are gone. Refrigerate the batter . Crepe batter should be refrigerated at least an hour. For best results, crepe batter can be refrigerated overnight. Heat the pan evenly . Most crepes cook best on medium-low to medium heat. Heat the pan for about 5 minutes before attempting your first crepe. Don’t use too much batter . 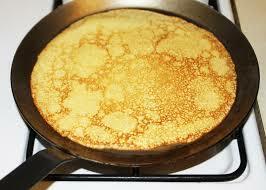 Crepes are thin and only a small amount of batter is needed to make one. An average sized crepe only needs about 2 ½ Tablespoons of batter. Pour the batter onto the hot pan and swirl the batter around until in fills the pan. Flip it just right . Because the batter is thin, crepes cook quickly. Cook the crepe for about 1 minute or until the edges of the crepe start curling up and the underside is starting to turn golden brown. Flip the crepe and only cook the other side for an additional 30 seconds. Most people use a thin spatula for flipping crepes, but some prefer using their fingers. Carefully, pick up the curling edges of the crepe and throw it on the other side. There you have it—your keys to successful crepe making! Of course, having a good pan and a great recipe will help too. You can actually buy non-stick pans that are designed specifically for crepe making. And here is a great recipe to get you started. Bon Appetit! 1. Blend all the ingredients together in a blender or food processor until smooth. 2. Refrigerate the batter for at least 2 hours—overnight is even better! 3. Heat pan over medium heat. Depending on the pan, you may want to coat the pan with melted butter to prevent it from sticking. 4. Pour 2 ½ T of batter in the pan. Swirl the batter around until it fills the pan. 5. Cook the first side about 1-2 minutes until the edges begin to curl. 6. Flip the crepe and cook for an additional 30 seconds. It should be spotty, golden-brown. 7. Transfer crepe to a plate to cool. 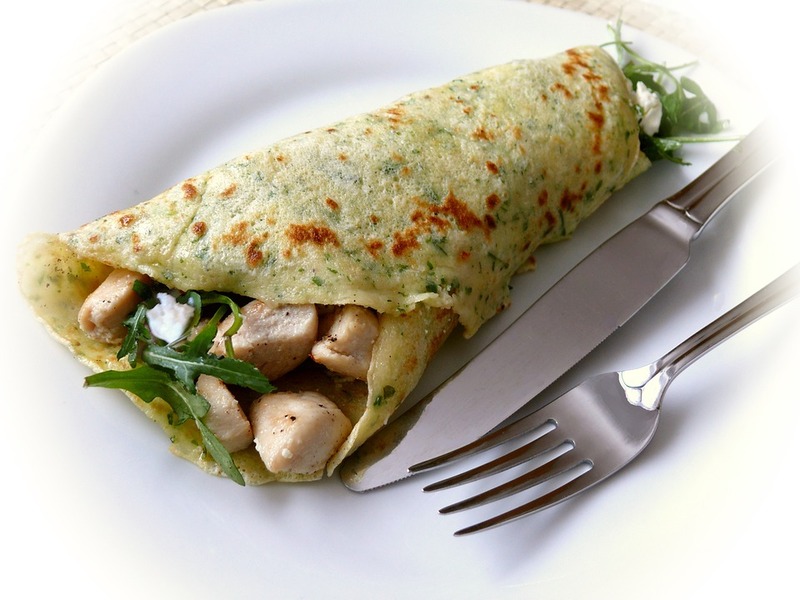 (Adding small pieces of parchment paper or wax paper between crepes will help the stack from sticking together). 8. Top and fill crepe with fruit, meat, veggies, etc. Enjoy!